The Kawasaki KH500 was a 500cc, 2-stroke, street motorcycle manufactured by Kawasaki for the 1976 production year. 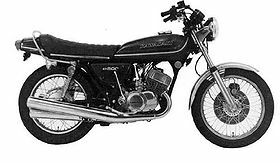 The KH500 was the successor to the Kawasaki H1 "Mach III". Changes between the H1 and KH500 was a lowering in horsepower, changing color and markings, a gear shift pattern change, and grips, water-resistant brake pads, and locking tank cap. A three-fuse system was adopted. Kawasaki also brought a brighter headlight to this bike. The KH was the model code change for the H1. This page was last edited on 10 December 2010, at 02:50.